The 1070 Ti fills the gap between the 1070 and 1080, just in time for the holidays. A solid offering launched into a crowded segment, and Pascal is over 18 months old now. 2017 has been a great year for technology, with more major CPU launches in a single year than I can recall ever seeing. We've also had a lot of excitement in the GPU arena, with Nvidia's GTX 1080 Ti, Titan Xp, Volta GV100 for deep learning, and AMD's RX Vega. Unfortunately, Vega was highly disappointing. On paper Vega looked like it might be a contender. Instead, we got a power-hungry GPU that couldn't even claim a decisive win over Nvidia's parts that launched a full year earlier. But competition in the graphics card market can be brutal. The 1070 trails Vega 56 by as much as 10-15 percent in individual games, and on average it's a few percent slower. Never mind the supply problems AMD continues to experience several months after the official launch, with higher than expected pricing. Never mind the distinct lack of custom Vega cards—a few are coming, but Vega 56 more than Vega 64, and the only cards in stock in the US currently consist of reference model designs. But AMD winning at any level just won't do, says Nvidia, so now we have the GTX 1070 Ti—which is now one of the best GPUs you can buy. This is Nvidia pouring salt into the Vega wound, and it hurts. The 1070 Ti slots in nicely midway between the 1070 and 1080, in price as well as performance. But did we really need another high-end $450 Pascal-based GPU? Probably not, though it's not all that unusual to see a fall GPU launch. It gives Nvidia a new product SKU for the holiday shopping spree, which is never a bad idea. I would have preferred a GTX 1060 Ti to fill the void in the $300 space, or lower prices on the GTX 1070 and 1080. Maybe next year. As far as features and the architecture, nothing has changed. We're still looking at Pascal, using the 18-month-old GP104 GPU found in the GTX 1080 and 1070. This time Nvidia only disables a single SMM, leaving us with 2432 CUDA cores—a substantial jump from the 1920 in GTX 1070. Base clocks are the same as the 1080, boost clocks are the same as the 1070, and the cards use GDDR5 instead of GDDR5X. Taken together, the 1070 Ti is a solid 10 percent faster than the 1070 in most cases, which is enough to clearly beat Vega 56 and often match Vega 64. Or for 10 percent more money, you can get a GTX 1080 that's about 10 percent faster than the 1070 Ti, and clearly faster (and more efficient) than any current AMD GPU. As we'll see in the test results, performance often tracks closer to the GTX 1080 when the GPU isn't hitting memory bandwidth limits (eg, at 1080p), but 1440p and especially 4k favor the additional memory bandwidth of GDDR5X. Note also that the 1080 card is an original Founders Edition model, while current offerings have moved to 11Gbps GDDR5X, so the gap would be slightly larger if you're looking at the latest custom 1080 cards. If you're using or thinking of buying a 4k display, you're better served by the GTX 1080 Ti. Yes, it costs quite a bit more, but cost isn't typically an overarching concern if you're gunning for 4k. 1440p remains the sweet spot, however, and the 1070 Ti does nicely here. Before I get to the benchmarks, let's talk about the testbed for a moment. You'll note that this is the same PC I've been using as a GPU testbed for over 2.5 years—it's the testbed I nabbed when I first came to work for Future / Maximum PC in 2015, and in terms of performance it's still holding up well. But time marches on, and I've been meaning to upgrade the testbed for a while. Broadwell-E didn't offer enough to make that worthwhile, Skylake-X has its own set of problems (like higher memory latencies compared to LGA1151), and while Ryzen 7 and Threadripper are great CPUs, they're not the best CPUs for pure gaming purposes. I want the GPU testbed to remove as many bottlenecks as possible, leaving the graphics cards to strut their stuff. The best solution? For now, that's Coffee Lake and the Core i7-8700K. Changing testbeds can be a nightmare, as I'd need to retest every game, on every card, at multiple resolutions. So rather than biting off that Herculean task all at once, I added a second testbed for the GTX 1070 Ti launch. It has the i7-8700K (running stock for now), 16GB of DDR4-3200 CL14 G.Skill memory, running in an MSI Z370 Gaming Pro Carbon AC motherboard. Storage remains the same, the CPU cooler is Corsair's H115i, and it's all running off a Corsair CM650x power supply in a Carbide Air 740 case. I'll be retesting other GPUs on the new testbed over the coming weeks/months, and I'll overclock the CPU as well, but the reality is that for gaming purposes, upgrading from a 3-year-old enthusiast rig to a newer 'mainstream' PC doesn't substantially change performance—though it did drop power use a fair amount. Another disclaimer: I need to retest all the games using the latest drivers, running the latest versions of the games. I've had to (temporarily) drop a few games from my test suite, simply because patches and drivers have altered performance to the point where old results aren't remotely valid, and I don't have time to retest everything right now. The benchmark sequence in Total War: Warhammer for example is completely different now than it was for the past year or so, and Ashes of the Singularity: Escalation performance has improved quite a bit in the past several months. I'm also looking to change up the list of games used for the coming year, but that will have to wait for another day. I've added results for Shadow of War and Assassin's Creed: Origins, with the caveat that all GPUs were tested on the new Z370 platform (though I did test the 1070 Ti on the old 5930K system as well). I'm planning to add a few more games (and replace older games) over the coming months, as there are several good candidates launching before the end of the year. As for APIs, I use the 'best' API for each GPU, at least in cases where there's a large discrepancy. That means DX12/Vulkan for AMD if it's an option, but certain DX12 games (Battlefield 1 and Total War: Warhammer I and II) continue to run better in DX11 mode on Nvidia GPUs. Since the image quality is the same, it's fair to compare performance using different APIs. With 15 games tested on all current GPUs, released between 2014 and 2017, I can cover most bases. There are multiple AMD Gaming Evolved titles (BF1, Civ6, DXMD, and Hitman) and quite a few Nvidia TWIMTBP games (Division, GR: Wildlands, RotTR, and some technologies in Dishonored 2 and Fallout 4). Most major genres are represented, and there are also DX12-enabled games. All tests are conducted at 1080p medium, 1080p/1440p ultra (close to maximum quality), and 4k at either ultra or high (depending on the game). The charts show both average framerates, along with the average fps of the bottom three percent of frametimes—the 97 percentile framerate. Given the modest bump in clockspeeds and core counts relative to the GTX 1070, performance is right where you'd expect it to fall. Comparing reference cards (except for the RX 570 and 580 and GTX 1060 3GB, where reference cards don't exist), the GTX 1070 Ti is about ten percent faster than the GTX 1070, and conversely about 10 percent slower than the GTX 1080. Across the full test suite, the 1070 Ti is slightly faster than Vega 64 at 1080p, tied at 1440p, and a hair slower at 4k. Meanwhile, against Vega 56 it claims a clear victory with about a 10 percent lead. That's good news for Nvidia and bad news for AMD's Vega, but for end-users the results are less exciting. If you're looking at a high-end graphics card, there's now a middle ground between the 1070 and 1080, but this isn't something we really needed, and with the price differences it's mostly a question of how much you're willing to spend. The GTX 1070 is a good card still, at just under $400. The GTX 1070 Ti is faster but costs more, and the GTX 1080 is faster still and costs even more. Overclocking muddies the waters, and the GTX 1070 Ti is fully capable of good overclocks. I was able to push memory speeds to 9GHz (effective) without any difficulty, with a 20 percent increase in the power level and a 150MHz increase to the base core clock. The result is that the GTX 1070 Ti runs in the 1900-2000MHz range, and overall performance is pretty much spot on with the GTX 1080. 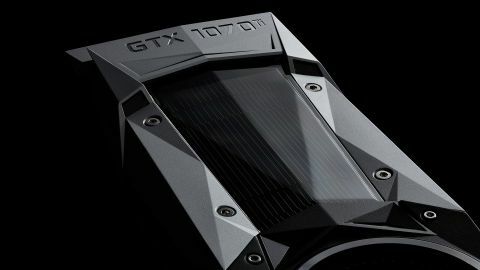 Rumors that Nvidia was going to lock down clockspeeds on the 1070 Ti proved false, which isn't too surprising considering the target market of gaming enthusiasts. What about the new test platform, can Coffee Lake improve gaming performance either more? It turns out that an overclocked i7-5930K still holds up very nicely. The i7-8700K (at stock) wins some tests and loses others, and overall it's a tie. The only real loss is in power draw, where under load the 5930K at 4.5GHz uses around 100W more power than the 8700K. Sort of like how the 1070 Ti and Vega 64 are so closely matched, but the latter uses 100W more power. The GTX 1070 Ti is a completely capable card, but it also feels underwhelming. This long after the first Pascal parts launched, it's hard to get excited about a new part that fills a gap, particularly when it's a small gap and it's not really a huge bargain. Trying to determine who should upgrade to the 1070 Ti gets a bit messy. Did the GTX 1070 and 1080 not entice you to pull the trigger on a graphics card upgrade last year? The 1070 Ti is in the same boat this year. But maybe you had a recent windfall, in which case it's a reasonable option. But if you're willing to spend $450, why not go for the faster GDDR5X and additional cores in the GTX 1080 for less than $50 more? If you want proof of the lack of innovation that happens when the market leader remains unchallenged, look no further. Had AMD's Vega taken down GTX 1080 Ti, Nvidia would be doing far more than a rehashed GP104 that lands between two existing products. Ryzen and Threadripper forced Intel to step up to the plate and deliver more cores and better pricing per core with Skylake-X and Coffee Lake, and the CPU market at least has been very exciting this year. With the GTX 1080 still beating the RX Vega 64, never mind the 1080 Ti and Titan Xp, Nvidia has given us a very competent product, but nothing revolutionary or even evolutionary. The GTX 1070 Ti isn't a bad product at all, but it's going after a relatively small niche between the $400 and $500 graphics cards. Most gamers are buying cards in the $200-$300 range, and will continue to be served by Nvidia's GTX 1060. There's a chance the 1070 Ti will cause retail pricing of GTX 1070 cards to drop a bit more, but we still haven't returned to the pre-cryptocurrency-craze prices of as little as $350 for a GTX 1070. Hopefully that will happen during the holiday shopping season.